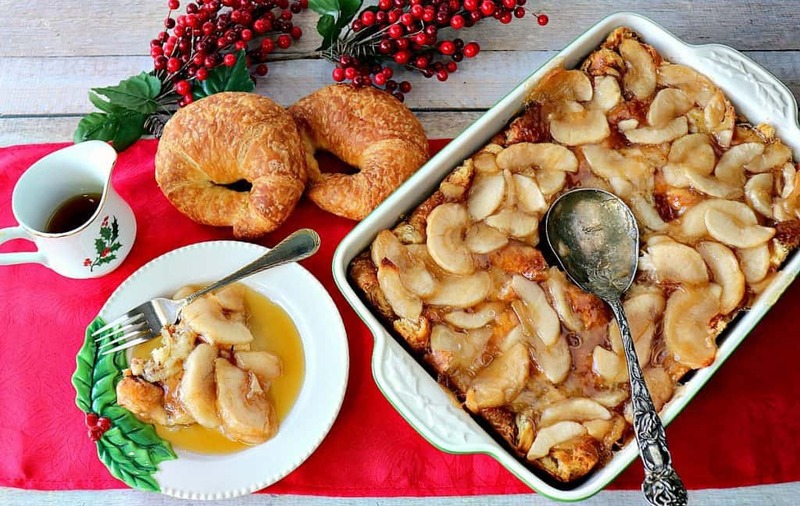 Treat your family and friends to a breakfast gift this year with this Easy Make-Ahead Christmas Morning Croissant Apple Breakfast Bake. It will be a deliciously sweet start to a very wonderful day! 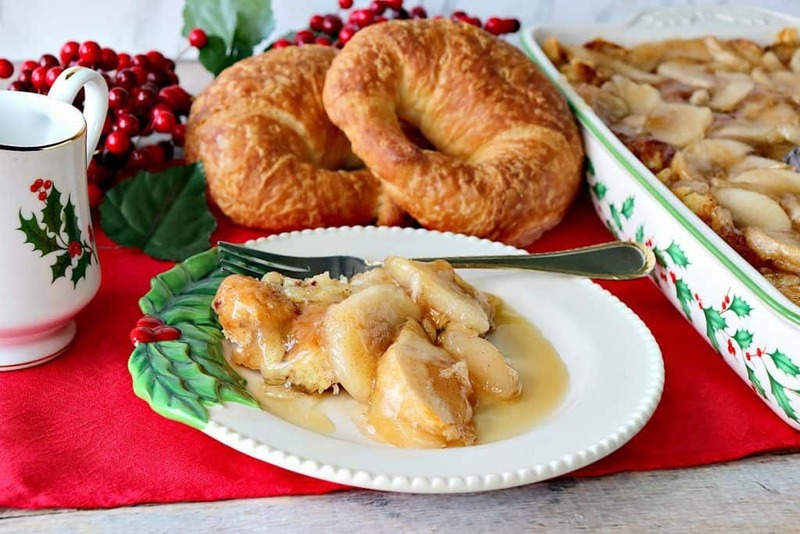 **Please Note – The printable recipe card with detailed instructions and complete ingredient measurements for making Easy Make-Ahead Christmas Morning Croissant Apple Breakfast Bake is available near the end of this post. That’s it! You can get much easier than that!! In a large bowl, whisk together the eggs, maple syrup, melted butter, milk, salt, and cinnamon. Set aside. Break the croissants into small bite-sized pieces and place them evenly into a 9×13 baking dish that has been sprayed with baking spray. Pour the egg mixture evenly over the croissants, making sure to press the croissants into the egg mixture. Top the casserole evenly with the apple pie filling. Cover and refrigerate at least 4 hours, but overnight is best. Remove from the refrigerator and allow the casserole to sit at room temperature for 45 minutes. 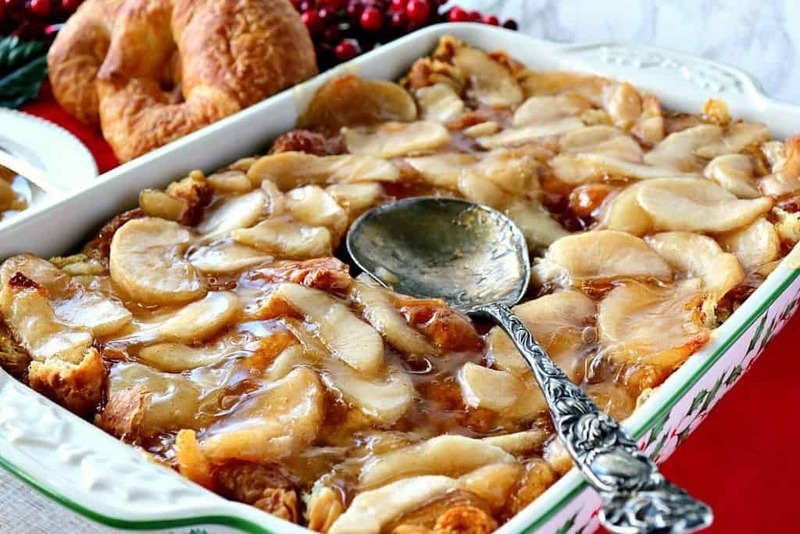 Place the Croissant Apple Bake in the preheated oven and bake for 90 minutes, or until the casserole is puffed, browned and cooked through in the center, the toothpick test works well to test the doneness. Cool slightly before serving and serve with a light dusting of confectioners sugar (not shown) and maple syrup if desired. 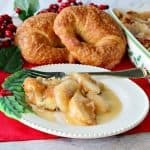 *The following affiliate links are some suggested products I’ve chosen that will aid you in the making and serving of this recipe for Easy Make-Ahead Christmas Morning Croissant Apple Breakfast Bake if needed. By clicking on the item photo, you’ll be taken directly to Amazon.com if you’re interested in purchasing any of these products. You are in no way required to do so, and you will not be charged in any way unless you decide to purchase one of these products through Amazon.com. As an Amazon Associate, I earn from qualifying purchases. 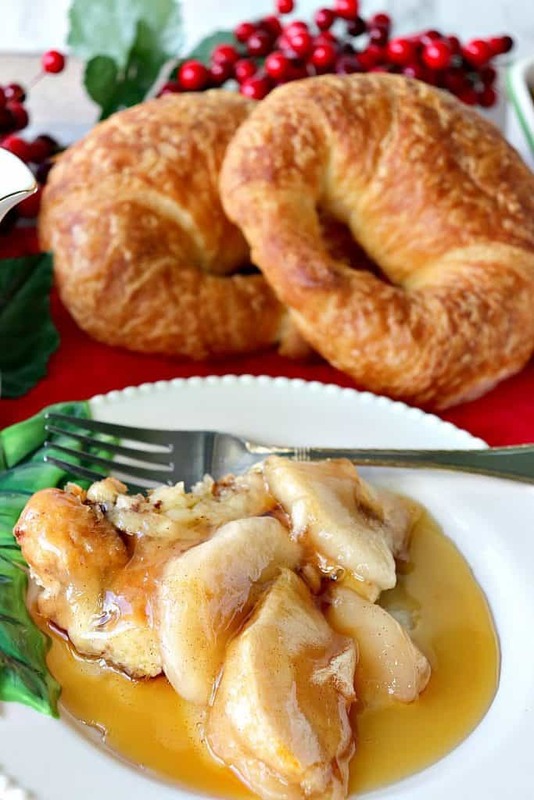 Below is the printable recipe card for today’s Easy Make-Ahead Christmas Morning Croissant Apple Breakfast Bake. If you’ve enjoyed this recipe and look forward to making it (or have already made it), I’d appreciate if you’d take a moment to give it some feedback by way of stars near the comment section at the end of this post. Thank you so much! In a large bowl, whisk together the eggs, milk, maple syrup, butter, cinnamon, and salt. Set aside. Place the broken croissants evenly into the bottom of a prepared 9x13 baking dish that has been sprayed with baking spray. Pour the egg mixture evenly over the broken croissant pieces, making sure to press the croissants into the egg mixture. Spread the apple pie filling evenly over top of the croissant egg mixture. Allow the croissant bake to sit at room temperature at least 45 minutes before baking. Bake the casserole for 90 minutes, or until the center is set, the casserole is puffed, and the top is golden brown. Sprinkle with confectioners sugar before serving and additional maple syrup if desired. 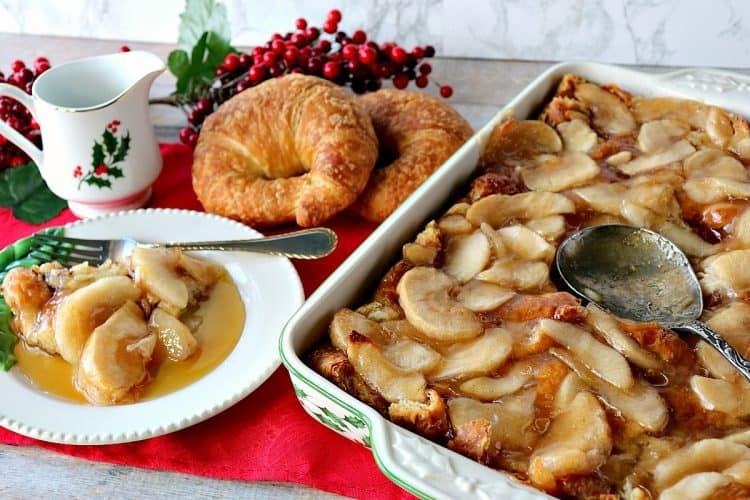 I sincerely hope you’ve enjoyed today’s recipe for Easy Make-Ahead Christmas Morning Croissant Apple Breakfast Bake as much as I’ve enjoyed bringing it to you! I have to make this for breakfast next weekend! It looks so delicious!! 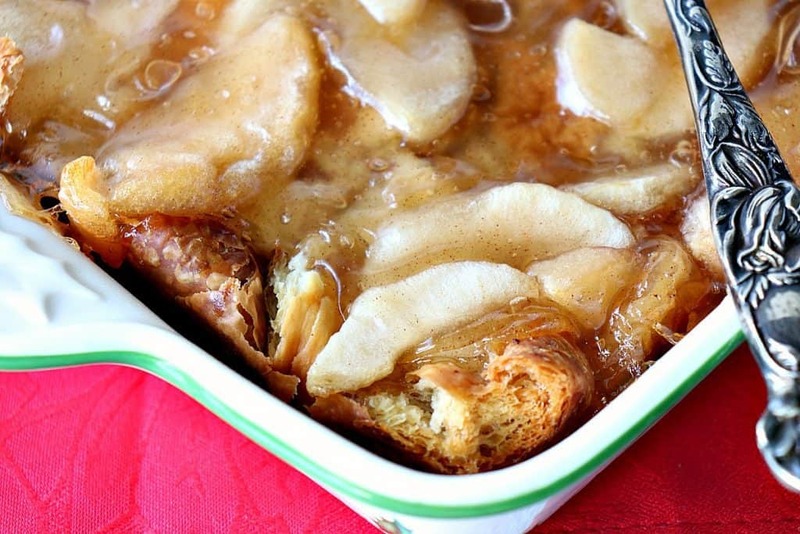 A perfect recipe to use up all those apples that we picked in October. I’m sure it will be a hit! Thanks for stopping by. Please enjoy! I’ve never tried a breakfast bake like this before, and it looks so decadent and sounds so easy! Such a great idea, I’m so looking forward to making this soon! I know you’re going to love it, Dini. Thanks for stopping by. This would b a dream to wake up to on Christmas morning, Renee! This is a wonderful way to start Christmas! So easy and looks delicious! This is a great way to start our Christmas! Glad you think so, too!